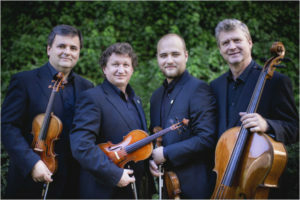 The Wihan Quartet has been described by International Record Review as: ‘ one of the best quartets in the world today.’The Quartet is celebrating 30 years since its formation in 2015 and over the years it has developed an outstanding reputation for the interpretation of its native Czech heritage, and of the many classical, romantic and modern masterpieces of the string quartet repertoire. The Quartet’s recording of Dvorak Op.34 /Op.105 was chosen as a ‘Recording of the Year’by MusicWeb International and BBC Music Magazine said of their Dvorak Op.61 recording: ‘This is the finest recorded performance I have encountered to date’ . During the 2012/13 season the Quartet was Czech Chamber Music Society Resident Ensemble at the Rudolfinum Dvorak Hall, Prague. In 2008 the Quartet completed the first ever cycle of Beethoven Quartets in Prague and also repeated this cycle at Blackheath Halls, London. This landmark series of Beethoven concerts in Prague was recorded for release on CD and DVD for Nimbus Alliance and received many accolades. The Wihan Quartet has won many International Competitions including The Prague Spring Festival and the Osaka ‘Chamber Festa’. In 1991, they won both the First Prize and the Audience Prize in the London International String Quartet Competition. Since that time they have developed an impressive international career, which includes visits to major festivals in Europe and the Far East. They visit Japan regularly and have had highly acclaimed tours of the United States, Australia and New Zealand. They are also frequent visitors to the UK. The Quartet are the ‘Richard Carne Quartet in Residence’ at Trinity Laban Conservatoire of Music and Dance, London and also coach at the Royal Academy of Music, London. For several years they have taught many of the UK’s gifted young Quartets at Pro Corda in Suffolk and are also great supporters of the work of the CAVATINA Chamber Music Trust, which gives inspirational concerts and master classes to young people in many parts of the UK.